Etosha National Park and Chobe River Safaris are schedule back-to-back so you can do both safaris in one trip to Africa. Detailed planning was done to provide a smooth transition from Namibia to Botswana and ensuring for optimal time in the field. Discount available if both are booked at the same time. Addition extension to Victoria Falls is also available after Chobe. Deposit: $1,000.00 per person at time of registration - You may register for this safari using the form at the bottom of this page. - Price includes round-trip airfare from Johannesburg, South Africa to Namibia. - Professional Guides, world class photographers in their field. - Customized photo vehicles with only three swivel seats per vehicle each with Wimberley gimbal heads. - Top photo safari destination where, during these dry winter months, the wildlife are at the water holes and easily located. - The landscape provides breathtaking images, with clean fore and backgrounds. In 1907 one of the largest wildlife reserves in Africa was created around the salt pans of northern Namibia. Etosha is legendary among wildlife photographers for the large concentration of mammals and birds that are seen in the region. The salt pan itself covers nearly 9,000 square miles and is heavily populated despite its dryness. During the winter months, when we will be there, the dry conditions cause animals to congregate near the waterholes. Predators and prey interact around these holes as they are highly aware of each other and play out the oldest drama of all species: obtaining water and food. It is to the magnificent waterholes, present since the dawn of time, that we will travel to photograph from our specially designed photo safari vehicles. This Dry Water Safari is designed to stand alone, but is a perfect complement to the Chobe River safari which follows. By joining both you have not only the best of Dry and Wet safari experiences, but also a completely different mix of animals and birds with to photograph and enhance your skills. 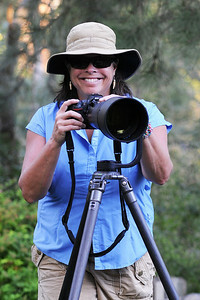 These two safaris is a true photo workshop and not just an opportunity to see and take images. Our trip of 8 nights and 9 days will begin and end in Johannesburg, South Africa. After arrival and overnight on August 14, we will depart the morning of August 15, 2018 for Windhoek International Airport, Namibia; transfer to our lodging and prepare for our trip north to Etosha National Park. The next day we will travel by air-conditioned shuttle, and arrive at our next lodging where we will have lunch and an afternoon game drive. The next six days will consist of two periods of photography separated by time at the lodge for meals, photo reviews and critiques and instruction. Should you wish, we can arrange to stay out in the field for the entire day. Each full day will end with a much earned sundowner followed by dinner and back to our rooms for the night. Transfer the following morning to the eastern edge of Etosha National Park, where we'll be staying for the next six nights, at Mokuti Etosha Lodge which is minutes from the park gate. For those booking both the Etosha and Chobe safaris together, we fly back to Johannesburg on August 22, spending one night at the Intercontinental Hotel before our flight to Botswana the next morning. For those headed home, you will have arrived in Johannesburg in time to catch your evening flights home on the 22nd. Work at the waterholes is supplemented by classroom work daily in which images are uploaded, reviewed and critiqued and suggestions for improvement for the next outing are shared by our staff. Instructions on workflow, image rating and integrations with Lightroom or Photoshop are included for those with interest. The instructors are world class and experienced in International Photo competition. Come learn from the best. Day 1, Aug 14: Arrive Johannesburg. Meet and greet and overnight accommodations at hotel on the airport grounds. Day 2, Aug 15: Fly to Windhoek. Namibia and check into Klein Windhoek Guest House. Advance Planning for the trip, lunch and dinner, relax and consider, at your option, a walk through the charming city, visit the display of Gibeon meteorites (the largest groupings of meteorites ever known to have hit the earth) or take a one hour walk along the Hofmeyer trail, through aloe and countless bird species. Day 3, Aug 16: Depart, by air-conditioned shuttle for Etosha National Park in the morning, arriving midday at Mokuti Etosha Lodge and begin our safari outings. Day 4- 8, Aug 17-21: twice daily outings to nearby waterholes to photograph the many Namibian mammals and birds. We will take advantage of the best of morning and evening light. Photoworkshops will be held each day at the Lodge with time for uploading images, relaxing and taking a nap. Day 9, Aug 22: After breakfast, depart for Windhoek Airport and a flight to Johannesburg. If you extend to the second safari on the Chobe you will spend the night in Johannesburg. If you are ending your time with us, you will arrive in Johannesburg in time for evening flights home on the 22nd. Professional guidance and instruction by highly-skilled wildlife photographers with International Photo Competition Experience. Smaller lenses for close up work, your own camera body and your own computer laptop. These are optional but strongly encouraged. Travel and medical insurance and pre trip immunizations, which are recommended. After entering your information below, you will be directed to PayPal so you can securely complete your payment.